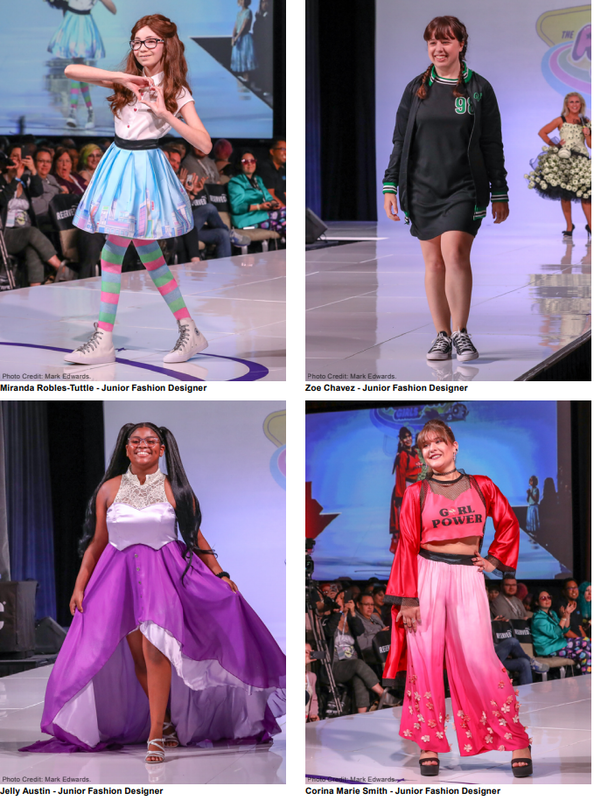 Geek couture at the Her Universe Fashion Show is an SDCC highlight, but there's so much more to the event that goes beyond the runway. 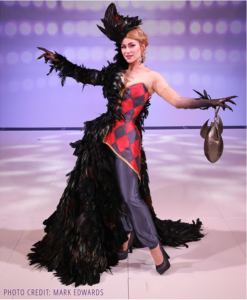 The Her Universe Fashion Show celebrated many milestones at this year’s SDCC event, held at the Manchester Grand Hyatt, including its own fifth anniversary. 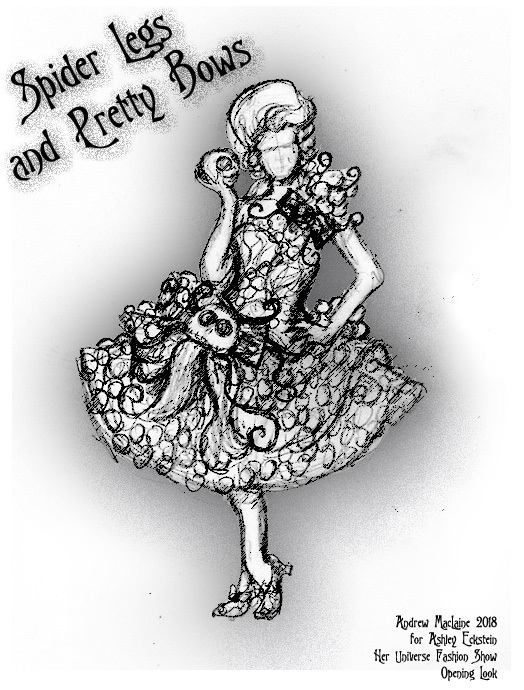 The Nightmare Before Christmas’ 25th anniversary was commemorated with a dress designed by Andrew Maclaine, the 2014 fashion show winner. The dress is comprised of 500 Jack Skellington Funko POP! figures and weighs in at 40lb, almost twice as much as last year’s 25lb LEGO dress. 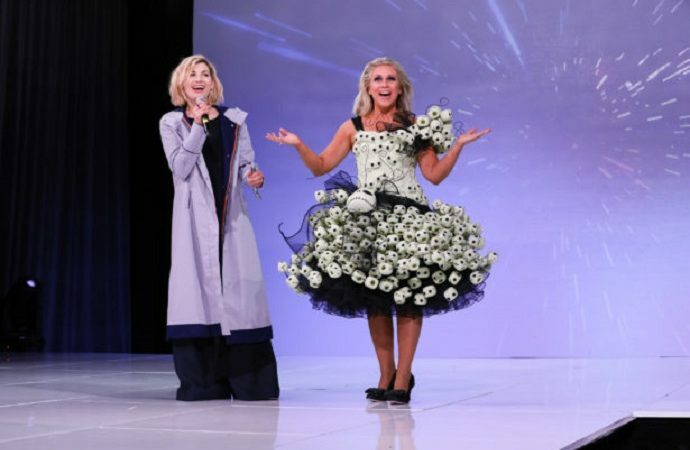 Her Universe founder and show host, Ashley Eckstein, had not expected to wear the heavy dress for the entire two hours of the event, but when the Thirteenth Doctor appeared and asked to walk the runway, Eckstein gladly handed over the new Her Universe-designed Doctor’s coat and the newly revealed sonic screwdriver she had intended to wear so that Jodie Whittaker could strut her stuff on the stage. The coat, along with a rainbow striped top and blue trousers, will hit Hot Topic stores in the U.S. come the fall. “Any age. Any gender. Anyone can wear it. You’re not dressing as a girl. You’re dressing as THE DOCTOR,” proclaimed Whittaker. 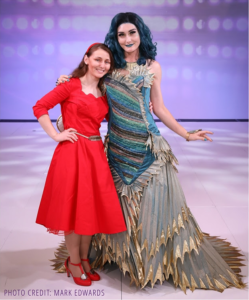 As if an impromptu celebration of the first woman to portray The Doctor wasn’t enough, the fashion show also celebrated 10 years of Star Wars: The Clone Wars and the emotional return of the series. Eckstein welcomed fellow voice actors Dee Bradley Baker (Captain Rex) and Matt Lanter (Anakin Skywalker) to the stage in new outfits inspired by their Clone Wars characters for the Our Universe unisex line. A new Disney Princess line and Marvel products premiered as well, and Eckstein proudly announced that all 25 designers of the 2018 event would begin work the very next day on a new line of Avengers 4 themed designs that will arrive just in time for the next film. But the show wasn’t done with its celebrations and announcements just yet. Instead of the usual intermission while judges tallied their scores, junior designers between the ages of six and 17 hit the stage, sponsored by Cartoon Network, to show off their Powerpuff Girls-inspired designs, celebrating 20 years of the Powerpuff Girls saving Townsville from evil. Junior designers presenting their Powerpuff Girls designs. Photos by Mark Edwards. Fans also got a chance to flaunt their stuff on the catwalk (special love for all the raucous applause when people showed off skirts and dresses WITH POCKETS). When the dust finally settled, Eckstein announced the winners. 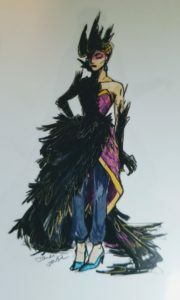 Jane Burson claimed the Singer Sewing prize for her “Howl-in’ For You” design based on Howl’s Moving Castle, which she modeled herself on the runway. 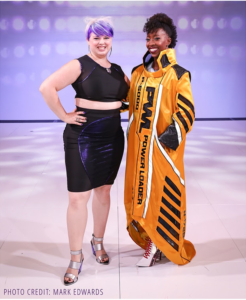 Kristi Siedow-Thompson was the fan favourite with the “PWL Chic” design based on Ripley’s power loader in Aliens. 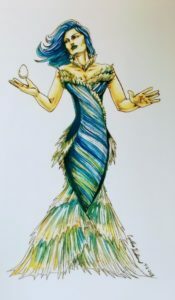 And the judges selected Cynthia Kirkland’s The Shape of Water inspired design, “The Couture of Water,” as the overall winner of the show. But Her Universe’s SDCC presence didn’t end when the lights went down. Nor was it limited to the show floor. 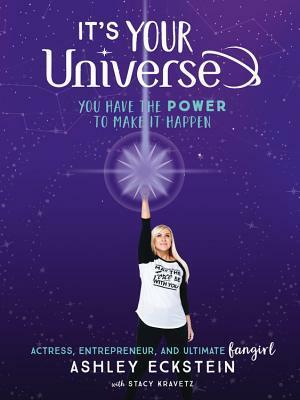 On the Friday following the event, Eckstein hosted a two-hour workshop for aspiring geek fashion entrepreneurs, and joined author and journalist Amy Ratcliffe to discuss Eckstein’s new book It’s Your Universe: You Have the Power to Make It Happen. 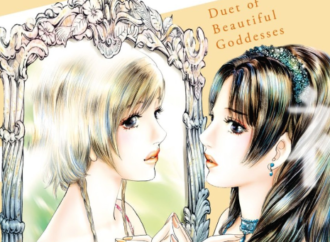 The semi-autobiographical book documents her journey, with emphasis on perseverance and following her dreams, and encourages readers to do the same by taking notes and making lists within the book itself. It is dripping with Disney images and quotes about the hard work needed to make your dreams come true. In fact, it is dripping with Disney in general, as that is practically where and how Eckstein grew up after her mother vowed that they would move to Orlando to pursue their family dreams. Four years after that vow, they had indeed moved to Orlando and her father accepted a position at Walt Disney Studios. As she grew up, Eckstein’s acting career simmered along in various Disney venues until she eventually landed her breakout role as the breakout character, Ahsoka Tano in Star Wars: The Clone Wars. Ashoka was the start of many things for Eckstein, including Her Universe itself, which came about because Disney refused to believe that girls and women had any interest in Star Wars apparel or toys. Not satisfied with wearing ill-fitting mens T-shirts, and extremely disturbed by fandom gatekeepers who bullied girls and told them that “Star Wars is only for boys,” Eckstein struggled to find a way to change that perception. When Disney refused to change its ways, Eckstein realized that she had to make the products herself. But starting a business isn’t easy. 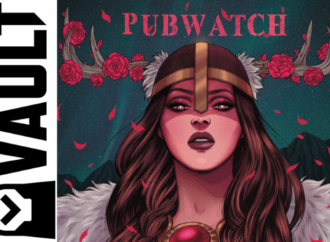 Through a lot of heartache and rejection, she finally managed to pull Her Universe together, but was given strict licensing limitations: it would not be sold by Disney’s retailers. Never one to give up, she rallied her troops: the fans. Her Universe’s success grew largely out of that rallying cry that brought fans together to help promote the Star Wars T-shirts for girls and women online and to vote with their dollars. Eventually, seeing the online success, Disney acquiesced and allowed her to sell her shirts at the Disney park, but only at their Star Wars Day events. They sold out almost immediately, which was the same result when Eckstein later approached Hot Topic. Eight years later, geek fashion that allows us to express our love of any given fandom on a day-to-day basis is in high demand by fans of every gender. 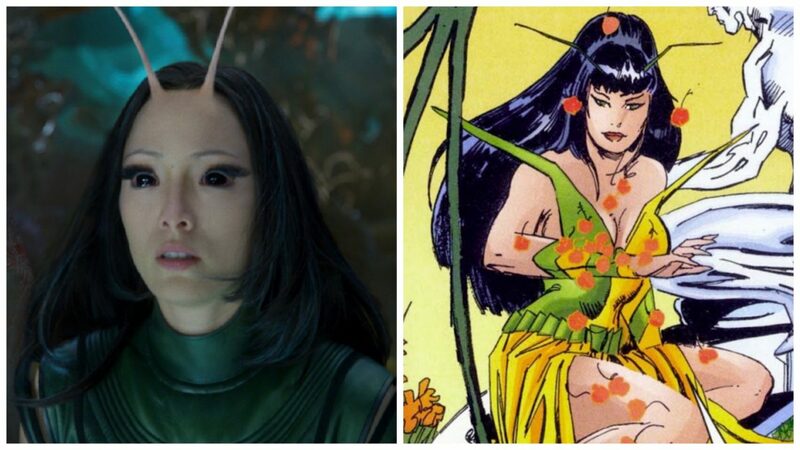 The Her Universe Fashion Show itself proves that geek couture is so hot right now. And Disney is finally embracing the concept. Eckstein’s success has helped pave the way for many geek fashion entrepreneurs to step into the business, which brings us back to the SDCC Her Universe Workshop with panelists Cindy Levitt, Senior Vice President of Licensing for Hot Topic, Her Universe, BoxLunch, and Torrid; Theresa Mercado, Hot Topic’s Vice President of Product Development; Professor Susan Scafidi, founder and director of the Fashion Law Institute at Fordham Law School, and Tina Aznavour, General Manager of Loungefly Inc. 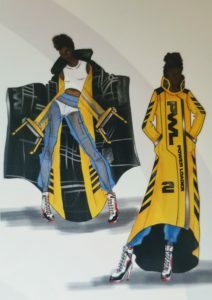 The mission of the show, Eckstein explained, has always been to educate and provide opportunities for designers, as much as it is to showcase the designs. Eckstein wants everyone to follow their dreams and succeed, but that means understanding that behind the creative design process is a very daunting business aspect that will likely take up about 90% of a business owner’s time, leaving surprisingly little room for the creative passion that prompted them to start the business in the first place. In the workshop, Eckstein spoke of her trials and tribulations, starting with the name of her company itself. She had originally intended to call it “Sci-Girl,” with the tagline, “It’s Her Universe.” The trademark was available to her for the clothing line, but even at that early stage in the game, Eckstein had her sights set on branching out well beyond fashion. At the time, she was poorly advised to obtain trademarks in every category she could think of, including amusement park rides. But entertainment was what was most important to her after fashion. Unfortunately, PBS already had a television show called SciGirls, which was too close to the name Eckstein originally wanted. 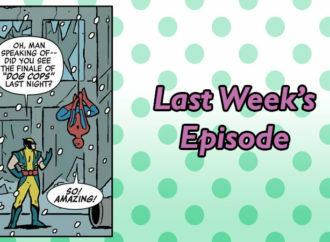 On a whim, Eckstein switched to “Her Universe,” and here we are today. 1. Copyright: Artistic work falls into this area, but, Scafidi noted, United States fashion laws do not offer a lot of protection in this area. A two-dimensional design, pattern, or an image of a product can be copyrighted, but the finished product itself cannot be copyrighted. 2. Trademark: These are the signs and symbols of your trade, encompassing all the categories and countries you wish to cover. This requires a significant investment in funds and, because of the U.S.’s first to use clause versus the first to file clauses elsewhere, it can pose a lot of risks for a business owner. This is because the U.S. requires that use or intent to use be shown before a trademark is granted, but someone from another country can snap up that trademark in the meantime. As with Eckstein’s Sci-Girl, part of the trademarking process also involves researching your desired name to be certain that no one is using it or something similar within areas you wish to cover. 3. Patent: The zipper, Velcro, and design elements in Nike shoes are all examples of inventions that can be patented. Scafidi spoke at length about the legal aspects of the business, with confirmation from Eckstein that understanding as much as possible about this aspect of the business and having a trusted lawyer at your side is paramount to success. Workshop attendees were encouraged to check out the Fashion Law Institute to learn more. Aznavour shared her success story and the fact that it started with a leap of faith and involved many failures. But learning from those failures and being passionate are the key to success. And when it comes to getting into the industry, she and Eckstein both noted that starting your own business isn’t necessarily the first step. In order to learn about the industry, Aznavour suggested working behind the scenes for companies like Loungefly and Hot Topic in order to learn the mechanics of the industry. Levitt, who was recently elected chairman of the International Licensing Industry Merchandisers’ Association (LIMA) jumped in with the very important topic of licensing, which is an area that many artists and designers toe the line. But as geek fashion, fanart, and fanfiction gain more and more mainstream attention, Levitt warned that companies are watching closely. This can be both a boon and a bane to small business owners, but the situation has changed significantly since Eckstein had approached Lucasfilm with the hopes of designing Star Wars shirts for women and girls. Eckstein and Levitt recommended that a small business needs to start small when it comes to licensing. Lucasfilm isn’t going to trust their license to a company that has not proven itself, but many smaller IPs are interested in licensing their properties. Working successfully with smaller licensors is how to get your foot in the door and build up a strong portfolio. Eckstein pointed out that the Her Universe Fashion Show’s beauty sponsor, Espionage Cosmetics, started this way. 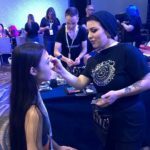 Following the workshop, WWAC caught up with Espionage Cosmetics’ nerd boss Jaimie Cordero, who went into some detail on how Espionage has grown into the successful business it is today. 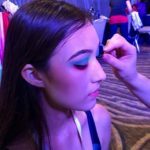 Established seven years ago in Cordero’s own home, the makeup artist did her research and put together an FDA compliant room to begin designing her own line of cosmetics. “I am not a hobby-level human,” she said. When she wants something, she goes from zero to 60, working hard to achieve her goals. She watched and learned from people who made their own cosmetics, eventually creating a “Muggle friendly” collection that she exhibited at Geek Girl Con, alongside a more niche “Brown Coat” collection based on her new found love of Firefly. Despite the seemingly small market for such a product, the fact that it sold out inspired her to dig deeper into nerd makeup, which used to be an oxymoron of sorts. 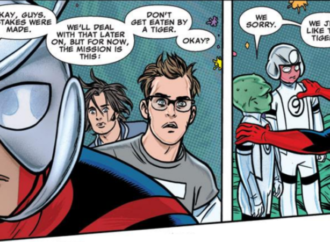 Espionage’s goal is to take the intimidation factor out of cosmetics by fusing them with the things nerds love, removing the connection makeup may have had with the kind of people who typically insulted and bullied nerdy folks for their passions. Espionage Cosmetics now “features a line of cruelty-free makeup and nail wraps inspired by things we love including comic books, video games, and sundry things throughout pop culture!” Their licensing opportunities started small and have since grown to include several major properties. 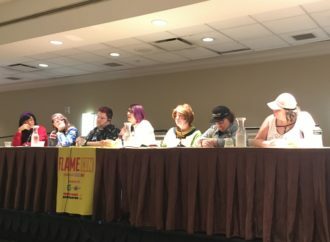 In the Her Universe Workshop, the panelists were careful to advise designers and artists of the dangers of creating works inspired by properties for which they do not hold a license. 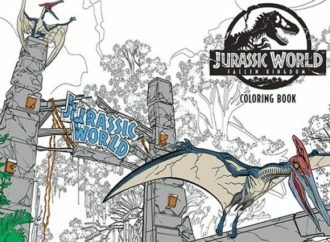 Companies are keeping a sharp eye on IP usage in its various creative forms, especially if people attempt to profit off of them. Cease and desist letters are becoming more common, but, Cordero notes, that could be considered an opportunity to negotiate with a particular company whose license you are interested in, though this should not be your initial course of action if you are serious about earning a licensor’s trust and subsequently, their business. Working with licensors to build strong relationships is yet another major factor in building a successful business. The onus is on the business owner to fulfill the licensor’s expectations, which leaves the business owner with a lot of liabilities. This means insurance is needed to protect yourself as much as possible, along with audits and clear adherence to approval processes. The final behind-the-scenes business factor focused on in the workshop was the distribution of the product itself. Mercado walked the group through product life cycle, which starts with the technical and artistic aspects of the design, right down to the minute details provided by a licensor in their style guide; sourcing the material to ensure quality and manufacturing compliance; shipping, factoring in the distance and time that the product has to travel; and retail distribution. Eckstein and Mercado explained the specifics of manufacturing that can result in minimum or maximum amounts per order. This includes moulds, how much time is spent at a particular machine, how much material is needed for each item—Eckstein noted that her introduction of plus size fashions caused a momentary stumble, because she had not expected additional costs—and maintaining low price points for customers. Maximizing manufacturing efficiencies is the key to keeping costs down for both the producer and the consumer. Mercado recommended the website, Maker’s Row to help people understand the various manufacturing processes.